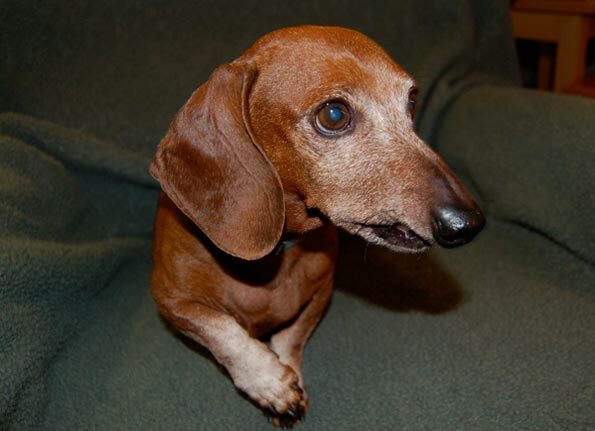 The email to us had a subject line that said “Doxie 69244 in need of rescue!” It came from the foster coordinator for an SPCA in Davis, California, that had sent us a number of disabled animals over the years. She wrote, “I know it’s a long shot, but no one else can take this sweet boy because of his age.” She wanted to know if we could possibly take him. 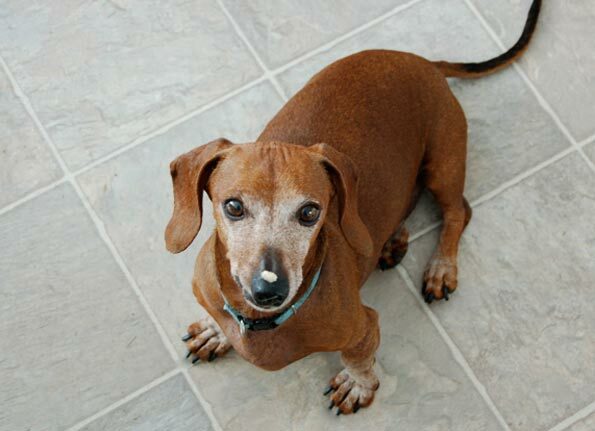 He wasn’t actually disabled, just elderly, but we’re known for having a soft spot for Dachshunds and we agreed to take him. To read about how we reached that decision, please see our blog post on his arrival here. 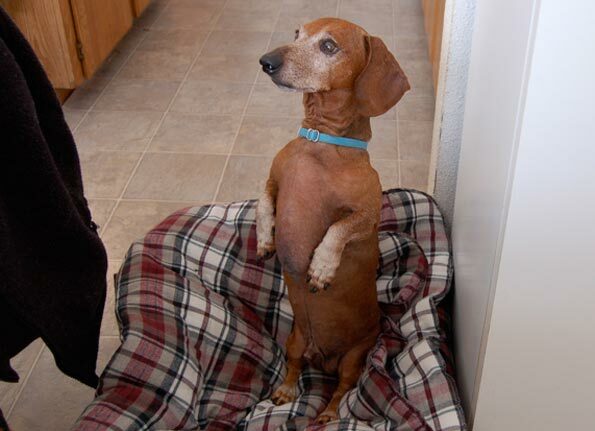 Because he didn’t exactly meet our criteria for disabilities, we decided to assign him one a hearing disorder common to Dachshunds. It’s called CSH, or Canine Selective Hearingitis. He does seem to have it, oddly enough. Even before he came, Alayne had decided to name him Dexter T. Dickens, with his middle initial ‘T’ standing for “the.” This little tyke has absolutely captured our hearts he is a pure joy and delight to have in our lives. Dexter is one of those once-in-a-lifetime dogs. And he is a dickens. Alayne’s choice of names was perfect. Alayne had been hoping for another Oscar, her uber-minion who worshipped her and followed her everywhere, but it turns out Dexter is a dual minion! He loves both of us equally, and he is always running back and forth to check on each of us. In fact, after his first couple of weeks here, he ended up as a “cottage dog” at night for that very reason. We were letting him sleep in the living room, but every night about 2:30 a.m. he’d knock down the child-gate in the hallway and march into our bedroom to see if we were still okay. He’d come over to Steve’s side of the bed first, stand up on his hind legs to see if Steve was still alive and breathing, then scurry over to Alayne’s side of the bed to determine her whereabouts. One of us would have to get up, take him back down to the living room, and put the child-gate back up. At 5:30 a.m. he’d do the same thing. Crash goes the gate, here comes the pitter-patter of tiny feet down the hall, then the inspection tour of the bedroom. 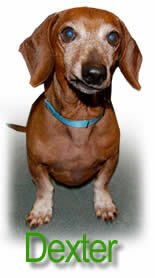 Somehow the child-gate manages to block Labs, Rottweilers, and Huskies, but not a determined miniature Dachshund. So now he sleeps in the cottage, and he’s not too happy about it, but at least we’re sleeping through the night again! In the morning, if Steve is the one who lets him out of the cottage, Dexter zooms into the house and races from room to room looking for Alayne. He jumps up and down at her feet, licks and wags, and then races back to Steve for some licks and wags. If Alayne is the one who lets him out in the morning, he’s not content until he finds Steve. Dexter just needs to make sure we’re both present and accounted for. And whenever one of us leaves the house, he gets restless and worried standing up and anxiously looking out the windows for us until we come back. He wants us to be together at all times. His pack isn’t complete if one of us is missing. Early on we discovered he loves to sit up when he really, really wants something like our lunch. That’s what he’s doing in that photo above. Hard to resist that, isn’t it? Somewhere he learned it was irresistible. Thus he also sits up like this whenever he wants well, anything: to be picked up and cuddled, to be taken for a walk, and of course, to get a bite of anything we just might be eating.